Place your palms on the floor and lift your buttocks away from the floor. Bend your L knee and sit on your L foot. Then bend your R knee and cross your R thigh over your L thigh. Touch your ankles and heels together. Use your hands to help move your legs into position as needed. Keep your toes pointed back. Raise your L arm beside your ear. Bend your elbow and touch your fingers to your upper back beneath the nape of your neck. Bend your R elbow behind your back and clasp your hands between your shoulder blades. Maintain this position for 30-60 seconds with normal breathing. Keep your head up and gaze straight ahead. 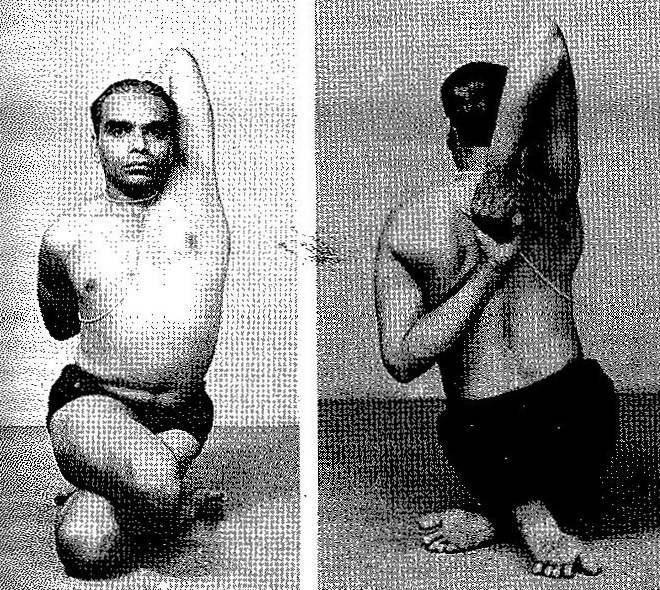 Iyengar and I perform this pose very similarly. However, his bottom arm (extended and internally-rotated shoulder) is more mobile than mine. Also note that I am demonstrating the side opposite Iyengar, but I have otherwise followed all the same instructions. Iyengar's steps for crossing the legs here are rather difficult and confusing for most students. I recommend setting up the legs for this pose by starting in a Tabletop (all fours) position, then crossing one thigh behind the other. Bring your ankles together, then sit back and lift your torso upright. For my students, this entrance is easier to understand and yields a deeper, richer, more stable posture.